which took place at the Joint Mathematics Meetings in Baltimore, MD, on Wednesday, January 15, 2014, 8:00--11:00 a.m. and 2:15--6:05 p.m.
Organizers: Carolyn Yackel and sarah-marie belcastro. This was the third such Special Session: here are the pages for the 2005 and 2009 Special Sessions. We again had a juried exhibition of fiber arts pieces accompanying the Special Session (see below for photos), and we again hosted the Knitting Circle (Thursday January 16, 8:15--9:45); photos here. The Special Session and Exhibit were covered in Scientific American with an article and slideshow. Each talk was 20 minutes long, with 10 minutes for questions and travel between sessions. And there were excellent questions asked after every talk! 3:45--4:35 Exhibit Time! Photos here. A note on the selection of talks: We were surprised, delighted, and gratified to discover that several more abstracts were suggested and/or submitted than we had room for in the Special Session. 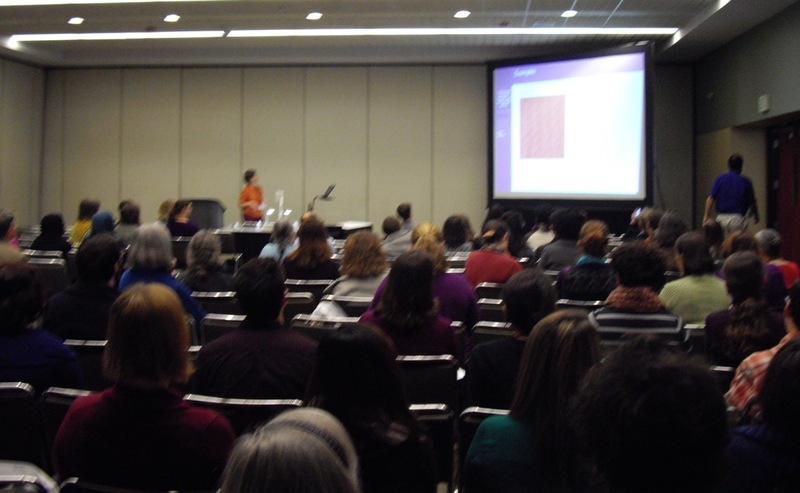 Where possible, we redirected the overflow to the MAA Math and Arts contributed session. In 1966 the NCTM published a 43-page volume by Magnus J. Wenninger, Polyhedron Models for the Classroom. This was the original inspiration for many a polyhedron model crafted in cloth. More recently The Symmetries of Things by John Conway et al, has inspired a renewed interest in exploring polyhedral models, including triply periodic polyhedra. This session will focus on pop-up models of the cuboctahedron, two examples of triply periodic polyhedra and include an introduction to the tools and methods. Until now, most methods for making a hyperbolic plane from crochet or similar fabrics have fallen into one of two categories. In one type, the work starts from a point or line and expands in a sequence of increasingly long rows, creating a constant negative curvature. In the other, polygonal tiles are created out of a more or less Euclidean fabric and then attached in such a way that the final product approximates a hyperbolic plane on the large scale with an average negative curvature. On the small scale, however, the curvature of the fabric will be closer to zero near the center of the tiles and more negative near the vertices and edges, depending on the amount of stretch in the fabric. The goal of this project is to show how crochet can be used to create polygonal tiles which themselves have constant negative curvature and can therefore be joined into a large region of a hyperbolic plane without significant stretching. Formulas from hyperbolic trigonometry are used to show how, in theory, any regular tiling of the hyperbolic plane can be produced in this way. One straightforward way to knit a trefoil knot is to tie a circular knitting needle into an overhand knot and knit a few rounds, as the author did in 2009. How might one knit more complicated knots? Of course, one can tie a circular knitting needle into the desired knot, and one can accomplish this by naively reproducing a knot diagram. Unlike the ease with which one can replicate a knot diagram on paper, it is quite challenging to thread a springy cable along the pattern of a knot diagram without assistance (from extra hands or masking tape). Some types of knots lend themselves to more systematic constructions. In the present work, we describe an algorithmic method for preparing circular knitting needles to create certain infinite families of torus knots and torus links. This work extends the "use the least amount of thread" work of Barbara Ashton and Kevin Dove to the "preferred" type of stitch on the back of the fabric where all stitches on the back are vertical. In other words, no horizontal stitches on the back are allowed. There is a "double row" idea here---each row now has a direction so there is an even/odd type behavior noted. Some of the regions Ashton and Dove showed were stitchable with the minimum amount of thread are not allowed when only vertical stitches on the back are allowed, but others that were not discussed in their work (they gave necessary but not sufficient conditions) by their method are natural results here. In addition, it is possible to assign a type of measure to the "badness" of non-vertical stitches on the back so that one can discuss optimal stitching patterns for regions other than those that can be stitched with only vertical stitches on the back. Other less traditional cross-stitch patterns will also be discussed. Students often struggle with abstract concepts from modern algebra and typical classes incorporate few ways to make the concepts concrete. Using a set of woven paper artefacts, this talk will present a possible way to visualize concepts (equivalence relations and equivalence classes, modular systems, groups of symmetries...) and making their abstract definitions more concrete. The set of artefacts used to illustrate these concepts are derived from our investigation of open- laced woven mats produced in several cultures in the South Pacific. The exemplars that will be shown present variations of the figure eight, and can be created using readily available materials and straightforward instructions. The standard Hilbert curve (a space-filling fractal) can be easily generalized to use any rook's tour (i.e. Hamiltonian path through a square grid) as the base motif, provided the endpoints are adjacent corners. The number of such paths is well-known for small boards--- it was the subject of a recent CMJ article, and the sequence itself (which is OEIS entry A000532) can be traced back to Mobius in the mid-1800's. Trying to build a similar construction starting with paths through hexagonal tiles leads to difficulties that do not arise in the square case, namely, that some paths cannot be fit together to form the next iteration of the curve. In fact, there are some curves which will form the first iteration, but then are unable to fit together to form a later iterate. This talk will explore some of these difficulties, along with some of the successes in finding such curves, and conclude with a realization of one of these curves in the form of a crocheted blanket. A fashionable and seam-reducing way to create knitted rectangles is to knit squares in the round. We can achieve a p4m (*442) motif by having each square consist of eight reflected isosceles right triangular fundamental domains; see, for example, Templeton squares. If the fundamental-domain triangle is decorated by a single arc connecting two edges, we can consider the resulting square to have an "inside color" and an "outside color." Simple modifications to this arc produce a family of square patterns. We discuss a method for obtaining a corresponding family of square knitting pattern instructions. The squares in our family can be assigned greyscale values and subsequently used to approximate photographs or create interesting visual images, somewhat like the modified Truchet Tiles of Bosch and Collier. A granny square is an example of a center-worked design, where material is built in rounds around a central point. If we replace this point with a one-dimensional "spine", polyominoes can be built using the same fundamental design process as is used in the granny square. However, certain polyominoes require different crafting techniques, generalizing the concept of a spine in order to be successfully built in the round. These generalized spinal techniques lead to several classifications for polyominoes according to their "crochetability", and enumerations of the polyominoes in each class. The complications of exploring spinal character for polyhexes and polyiamonds will also be explored. The Chinese Remainder Theorem (CRT) is a classical result in number theory on the existence of solutions to systems of linear congruences. Many number theory textbooks present applications of the CRT that are either classical riddle problems or problems involving denominations of money. 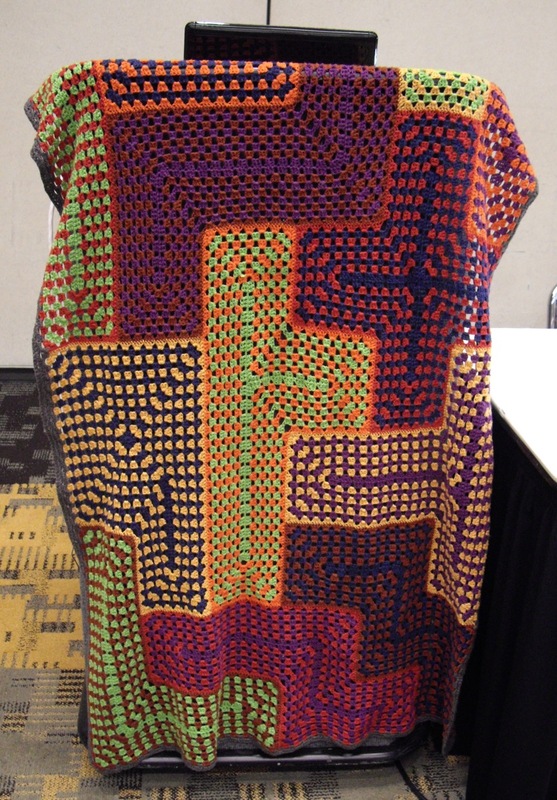 Interestingly, it turns out that the CRT can also be used to combine stitch patterns in knitting. The common knitting terminology used in stitch dictionaries can be rephrased as expressions in modular arithmetic. By constructing a system of linear congruence equations and using the CRT to solve them, a knitter can find the correct number of stitches to cast on to combine a variety of stitch patterns. This application can be interesting to number theory students who are looking for an example beyond the typical ones. In addition, we will discuss how to modify the problem when the congruence equations don't perfectly satisfy the hypotheses of the CRT, as well as ways in which the flexibility of real-world knitting does not exactly fit the world of number theory. Traditional cabled knitting can be very complex. Some recent knitting patterns use simple randomization to produce richly textured cabled fabric without memorization or charts. Most randomized cable patterns recommend occasional "cheating" to avoid aesthetic or functional problems. We analyze several models for random cables, ranging from coin flips through Markov chains on weighted tilings, and highlight the tradeoffs between mathematical aesthetics, physical aesthetics, and demands on the knitter. Tying a necktie may for some be the main if not only regularly occurring fiber arts activity they participate in. A chore for some, space for personal expression for others, the necktie used to have very few specific knots in widespread use. In their 1999 paper, Fink & Mao ("Designing tie knots by random walks." Nature 398, no. 6722 (1999): 31-32) enumerate all possible ways to tie a necktie. They limit their enumeration task by focusing on knots that present a flat front just like all the classical tie knots. They establish a list of 85 possible tie knots. Tie knots with intricate patterns of the necktie winding into symmetric but no longer flat front displays have emerged in the past decade, introduced by the movie Matrix Reloaded and recreated hobbyists. These tie knots are tied with the narrow end of the tie, wrapping it to create patterns on the surface of the tie knot. As such these knots are not covered by the enumeration proposed by Fink & Mao. We extend Fink & Mao's enumeration to include the various tie knots proposed in the reconstruction of the movie tie knot: these too can be captured by a formal language, and we can prove simplifications of Fink & Mao's original language that simplify the extension and analysis of all tie knots. With much gratitude to William Thurston, we now know that almost all knots are hyperbolic (the exceptions being torus knots and satellite knots). The same can be said for non-splittable links. A hyperbolic knot or link is one whose complement in the 3-sphere has a complete hyperbolic structure. In his widely distributed lecture notes "The Geometry and Topology of 3-Manifolds," Thurston presented explicit geometric structures for several examples, including the Borromean rings. He did so by decomposing each complement into two polyhedra (with vertices removed) whose faces are identified. In this project, we construct a quilt that exemplifies Thurston's decomposition of the Borromean rings. The quilt forms the boundary between the two polyhedra, with each of the faces in a different color. The quilt also holds the rings themselves.